Welcome to the Charles Michael Gallery where you will discover a vast selection of original vintage posters and fine custom picture framing services. The Charles Michael Gallery, formerly known as Galleri 7, has been a family-owned business for 35+ years specializing in conservation framing, print and painting restoration, as well as art consultation. We provide on-site consulting services, delivery and installation to private collectors, designers, architects, museums, and corporations. A few of our corporate clients include: Cannondale Bicycle, GE, GTE, IBM, Sikorsky Aircraft, Volvo North America, and Waterworks. Whether you need to linen-back your vintage posters, frame a family portrait, or restore an antique engraving or painting, we can assist you with our experience and creativity. With such a large collection, it is difficult to post every image on the site. Please visit us regularly to find new inventory, or email us any requests. Thank you for visiting our online gallery! 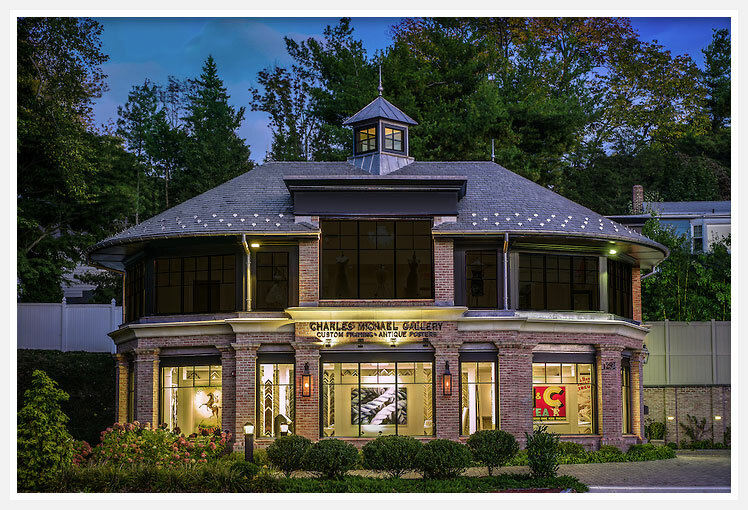 We would love to meet you in person at our location in Fairfield County, Connecticut, just thirty minutes north of New York City. American and European war posters (Pre-War, WWI, WWII, bond and loan, Emprunt National, Recruiting, Army, Navy, Marines, Soviet, Red Cross, Conservation, Salvation Army), and propaganda posters, such as the Mather Work Incentive posters. Rugby, soccer, football, baseball, ski, cycles, equestrian, horse jumping, swimming, tennis, ice skating, roller skating. Champagne, wine, beer and brewery, cognac, aperitifs, milk, and coca cola, to name a few. Cigars, cigarettes, men’s clothing, women’s clothing, shoes, furniture, and more. Ringling Brothers and Barnum and Bailey, Cylde Brothers, Cole Brothers, Friedlander, George, Carter the Great, Thurston, and more. We carry silent films only, theater, opera and more. Museum exhibitions, World’s Fair, flower shows, and more. Cappiello, Mucha, Cheret, Mauzan, Meunier, Ragan, Flagg, Pal, Steinlen, D’Alesi, Hohlwein, Colin, to name a few.